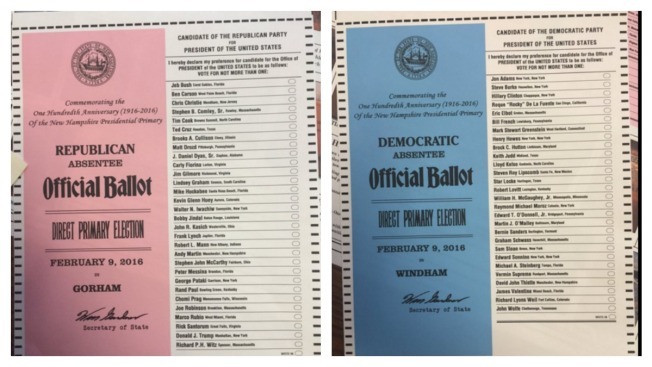 A look at what the Republican and Democratic ballots will look like in the New Hampshire primary. With no other states breathing down his neck, New Hampshire's secretary of state on Thursday scheduled the first-in-the-nation presidential primary for the long-expected date of Feb. 9, 2016. In past years, other states have jockeyed to move their primaries and caucuses earlier in hopes of grabbing some of New Hampshire's spotlight. But though national political party leaders recently have raised alarms about 2020, there was none of the usual wrangling over the calendar this year. Even the way Secretary of State Bill Gardner announced the decision was decidedly low-key: Unveiling a large poster commemorating the 100th anniversary of the primary, he simply waited for reporters to notice the date printed in small type atop the sample ballots pictured. "This is the first time in my years here that we will not be out of compliance with one or both of the parties," said Gardner. "In a year like this, everyone was expecting (Feb. 9) ... But once you do it, you do it. I knew what all of you were saying, and you were right." New Hampshire state law requires its primary to be held at least seven days ahead of any other similar contest and gives Gardner exclusive power to set the date. But the law's author, former Rep. Jim Splaine, said that's just one of the reasons New Hampshire has retained its role. Dismissing critics who argue new Hampshire is too small and too white, he and other defenders of New Hampshire say the country, and the candidates, are well-served because primary requires close contact with voters, not just name-recognition or advertising cash. "People really do participate, and we treat the candidates well," he said. "The fact that in New Hampshire candidates can talk with, instead of to or at people because it's not quite the media circus it turns into later with the larger states, New Hampshire really stands a chance, yet again, to serve an important role in American democracy." The political parties control the allocation of delegates and can punish states that jump ahead in the calendars they design. For 2016, New Hampshire will vote eight days after the leadoff Feb. 1 Iowa caucuses, followed by Nevada's Democratic caucus and South Carolina's Republican primary on Feb. 20, Nevada's GOP caucus on Feb. 23 and the South Carolina Democratic primary on Feb. 27. But things may not fall in line so easily in four years - Republican National Committee Chairman Reince Preibus recently said he doesn't think there should be any "sacred cows" when it comes to the nominating calendar. The 2016 ballots will include language commemorating the law that created New Hampshire's first presidential primary in 1916, and officials used a photograph of old ballots to replicate the font used for the words "official ballot." New Hampshire typically is among the top states in voter turnout during primaries, and Gardner expects the same to hold true this time. "We're tested every four years," Gardner said. "But the people of New Hampshire are going to respond like they always have."